If you want the busy, active Royal Caribbean experience but prefer a classic-style ship over the city-at-sea Oasis-, Freedom-, and Voyager-class experience, the 90,090-ton, 2,100-guest Serenade of the Seas or one of her three twin sisters might be the vessels for you. Launched one per year between 2001 and 2004, they’re Royal Caribbean’s most elegantly traditional ships, with classic nautical lines and handsome, nearly traditional interiors. One of the most noticeable things about these ships’ design is the amount of glass used in their public rooms, which helps bring the outside in when sailing scenic destinations like Alaska and the Norwegian Fjords. The ship’s atrium, for instance, has a five-story wall of glass on the port side, and rooms like the Viking Crown Lounge, Singapore Sling’s piano bar, the Sky Bar, Champagne Bar, and Windjammer Café all offer huge views. In the stern on Deck 6, a cluster of five intimate, interconnected lounges is one of the most classically designed spaces Royal Caribbean has ever created, giving a real old-world vibe with their Oriental-style rugs, parquet flooring, and woody wall paneling. 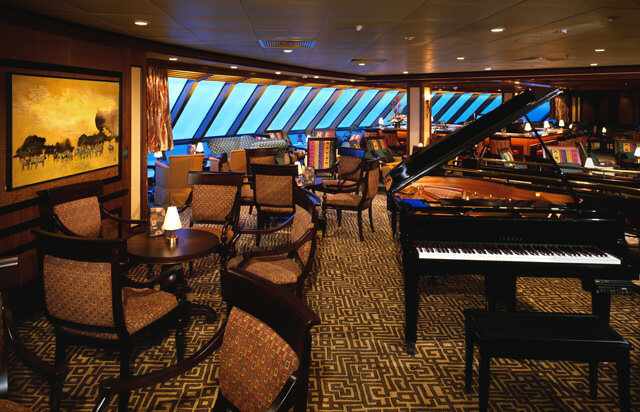 The romantic Congo Bar piano bar stretches across nearly the entire stern, offering views through floor-to-ceiling windows. Next door, the colonial-style Game Reserve offers some of the only pool tables at sea, kept level through gyroscopes that counteract the ship’s motion. 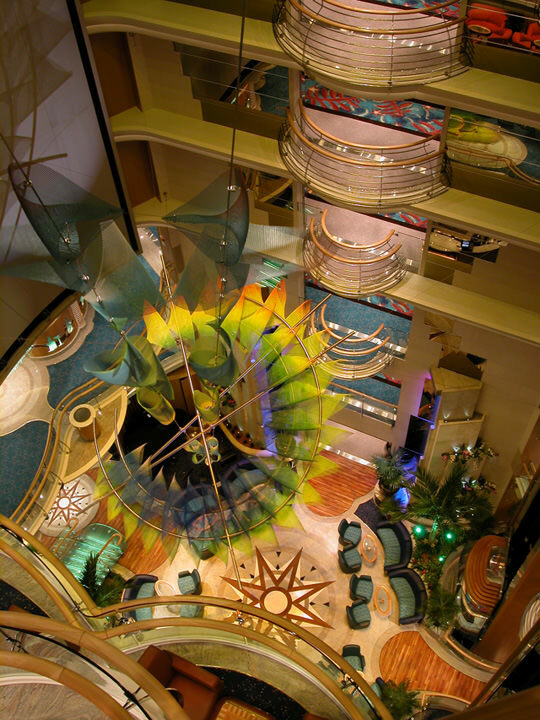 Other public rooms include the lovely main theater; the large Casino Royale; a baseball-themed sports bar with interactive bartop games; the nautically themed Schooner Bar; a specialty-coffee bar; and the Viking Crown Lounge, perched way up on Deck 13 and offering both quiet lounging space and a disco with a rotating bar. For kids, the Adventure Ocean center on Deck 12 includes a large, multi-area playroom, a video arcade, a separate teen disco, and a pool with water slide. Outdoors, Serenade offers a large and often busy main pool area; a covered, Asian-themed, adults-only Solarium; and a Sports Deck featuring a rock-climbing wall attached to the ship’s funnel, a basketball and volleyball court, a 9-hole miniature-golf course, a golf simulator, and a jogging track. 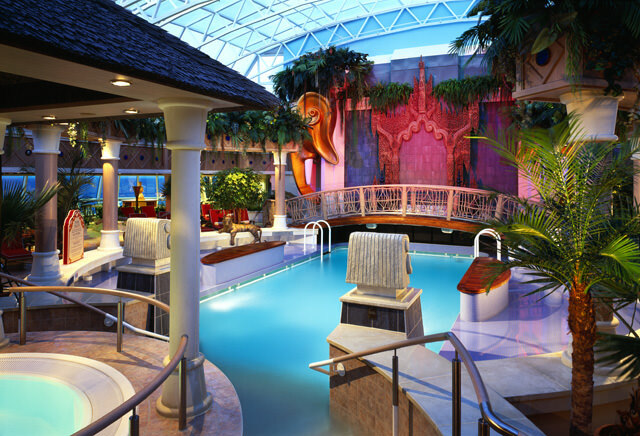 The spa and fitness center, a two-story space on Decks 11 and 12, offers a huge aerobics floor, dozens of exercise machines, more than a dozen individual treatment rooms, and a Thermal Suite steamroom with heated tiled loungers and showers that simulate tropical rain and fog. At dinnertime, guests can choose between several elegant options. The two-story Reflections Dining Room is a classic, glamorous cruise ship experience, decorated with silk-draped columns, a dramatic split staircase, and evocative artwork. The intimate, 90-seat Chops Grille is a classic steakhouse, decorated in dark woods and rich upholsteries, and offering lovely sea views. Just next door, the upscale, 130-seat Portofino serves Italian cuisine. A number of outlets scattered around the ship also offer quick, casual meals and snacks, including the Windjammer Cafe buffet restaurant and a pizzeria in the Solarium. Staterooms on board are pleasantly styled and fairly spacious. All offer small sitting areas, roomy closets, vanities with pullout trays for laptops, interactive TVs, minibars, and smallish bathrooms. More than half the cabins on board have private verandas. Most suites are located on Deck 10, and range from the 294-square-foot Junior Suite to the 951-square-foot Royal Suite, with its separate bedroom and living room, whirlpool bath, baby grand piano, and 283-square-foot veranda. Anyone who cruises on Royal Caribbean International’s new Serenade of the Seas will have a better experience than I did. It’s not that my experience was marred in any way. It was just too short. That’s the trouble with cruise ship inaugurals, where hordes of travel agents and a clutch of journalists are invited to spend a couple of nights on cruises to nowhere. That’s right, the ship doesn’t actually go anywhere, or at least to any place that you could write home about. In the case of Serenade of the Seas, we rolled our luggage onto the ship and left the New York skyline in our wake to float around somewhere off the coast. Nights, I could see lights twinkling on the distant shore, and I could even get a faint cell phone signal. We were emulating a cruise without actually being on one. But there are plusses to the inaugural cruise that you just don’t get on a regular cruise. For one, you meet the people who designed the ship, and through them, you see things that you might not have noticed on your own. Also, the ship’s captain is there, as are the top brass from the cruise line. You see the ship through their eyes. It’s like having a group of locals show you around their town. Our local was Joan Blackman, who escorted reporters on a two-hour ship tour. Curator for LCA Corporate Art Ltd., Joan was responsible for coordinating Serenade of the Seas’ $5.3 million art collection, which is the primary difference that distinguishes the 2,110-passenger ship from its nearly identical sister ships, Radiance of the Seas and Brilliance of the Seas. Joan told us that 128 artists from 30 countries were commissioned to produce 3,336 pieces of art for Serenade of the Seas. One of the more striking works resides in the two-story main dining room, Reflections. Commissioned to California artist Frank Troia, “Gala Suite” features a soft scene of couples dancing beneath Chinese lanterns. It is the largest canvas on any Royal Caribbean ship, measuring 15 feet tall by 12 feet wide. The painting’s immensity and its sensual colors, striking reds and blues with lots of yellow tones, form a beautiful central focal point for this grand restaurant. The painting also contrasts well with the series of burgundy and gold cloth columns that span floor to ceiling across the two decks of Reflections. Stairwells and landings throughout feature artwork in all sorts of media of flowers and portraits, including some by Andy Warhol. At some turns, art becomes whimsical. I exited the elevator on Deck 13 to colorful sculptured cows and a pile of cow dung that elicited a giggle from everyone who saw it. Other touches of whimsy include delightful oversized people sculptures: one of a plump blue man about to plunge into the pool, and another of a gigantic green woman and a small dog. The elephantine figures made me feel as though I were living in a cartoon. Serenade of the Seas is third in a series of four Radiance-class vessels (number four, Jewel of the Seas, debuts in May). This series of ship features nearly three acres of exterior glass. That’s more than a convenient factoid for marketing. The ubiquity of glass practically guarantees that you won’t miss a moment of the splendor and awe of the outdoors — even when you’re indoors. Passengers can even vertically traverse the decks without averting their gaze from the passing scenery, thanks to exterior glass elevators. Because architects are able to improve on their designs in subsequent ships in a series, Serenade of the Seas marks an architectural apex. 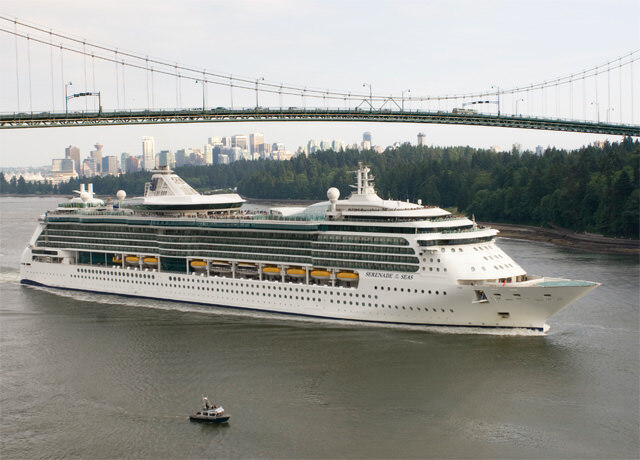 For example, Radiance of the Seas, introduced in 2001 as the first ship in the series, launched with a bookstore/coffee shop, called Books, Books, Books. Books weren’t selling that well, but coffee was, so designers decided to locate the newest coffee shop in the Centrum, which is more of a central congregation point. While such minor tinkering distinguishes Serenade of the Seas from its sisters, it distinguishes itself from other ships in more pronounced ways. For starters, it has the feel of a yacht, not that of a megaship or an oceangoing resort. Nowhere is that feeling more apparent than the Schooner Bar, a popular watering hole on Deck 6 (public rooms are concentrated on decks 5 and 6). Trimmed in wood and sailcloth, the nautical-themed Schooner Bar features leather chairs and sofas, nautical riggings, and glass-encased ship replicas. For me, the handsome Schooner Bar ranks among the most beautiful public rooms at sea. In late afternoon and in the evening, the Schooner Bar becomes the focal point of the ship — a good place for pre- and/or post-prandial cocktails. I liked the fact that both reservations-required dining venues — Portofino, an Italian-themed restaurant; and Chops Grille, an upscale steakhouse — were within striking distance of my bar stool. These cozy dining nooks, with entrances flanking either end of the Schooner Bar, have a $20 per person cover charge. Royal Caribbean touts, among other features, its signature rock-climbing wall, which has become an icon of the line’s latest advertising boost. The idea behind the campaign, encapsulated in the slogan “Get Out There,” is to portray cruising as providing activities that are anything but inactive. Thus, on Serenade of the Seas, active lifestyle cruisers will find plenty to keep their hearts pumping — including basketball courts, a jogging track, the ShipShape Spa and Fitness Center, as well as active excursions ashore. One of the great achievements of the Radiance-class vessels is that they combine yacht-like ambience with big-ship amenities in a way that does not seem forced or contrived. You feel like you’re on a small ship, but with all the conveniences of a large vessel. You can see all of this firsthand, of course, by booking yourself on board. But if you do, don’t settle for anything under a week. I know from experience that any less just won’t do. Serenade of the Seas’ $5.3 million art collection includes one piece that was supposed to be on Radiance of the Seas. Situated in the Schooner Bar, the piece is a striking life-size white and gold sculpture of a woman in a flowing gown — a figurehead from an old sailing ship. The story goes that while collecting art for Radiance of the Seas several years ago, one of the architects revealed that his neighbor had an old figurehead under a pile of hay in his barn in Sweden. The figurehead, salvaged from a 19th-century schooner named the Nightingale, was carved in the likeness of Swedish opera singer Jenny Lind, known as the Swedish Nightingale. When the schooner sank off the coast of Norway, divers salvaged the figurehead, and for years it was used as a scarecrow on a Swedish farm. After the story was made known, the piece appraised for close to $500,000, more than Royal Caribbean’s budget would allow to purchase the piece, so the line paid $75,000 to create a copy. Once done, the sculpture needed weathering for three years — too late to be included in Radiance of the Seas’ art collection, but just in time for Serenade of the Seas. What an appropriate ending for the Swedish Nightingale — to end up on a ship called Serenade. Do you knowthename of the artist who painted the boat pictures as you enter the ‘windjammer’restaurant?